Recently I acquired these two vehicles for preservation from a Funeral Company in Picton, William Groves. They were in use up until 12 months ago collecting the deceased and conveying them to the funeral home. William, a car enthusiest, believed the deceased should always be transported in an appropriate vehicle and not just a panel van. William died late last year and his family were keen to see these vehicles preserved.They are temporarily housed in the Emergency Services Agency Workshop in the ACT awaiting an undercover secure home. William purchased both vehicles from a dealer in Sydney in the late 70's direct from service. 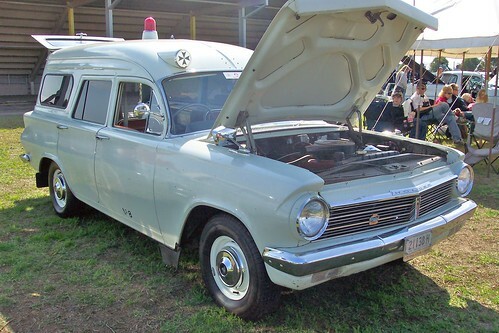 Little is known of the 1969 F100s history with the 1970 Fairlane being from the Manning District of the NSW Ambulance Transport Service Board. An annual report of the time states it was one of two similar vehicles that entered service that year, bringing the districts ambulance fleet to 11 in total which between them attended 6401 cases and traveled 139436 miles for the financial year 1969-70. Special note was made of the Fairlanes air conditioning, the report fails to mention an individual purchase price simply stating the value of fleet plus 3 support vehicles to be $42216. In comparison a modern single van based ambulance fully equiped comes in between $150-170000. I would welcome any feedback and suggestions around the preservation of the vehicles and any associated history. I am surprised that they let you keep the WG personalised plates. Are you intending to restore to ambulance spec or preserve as the vehicles are now? Good luck and if you can do a sound recording of each that would be nice! It is a shame there is no official presrvation scheme in place, or even an Ambulance Preservation Society type group. ASNSW did have a few bits and pieces, including the Willys Q-van, but even these are now neglected. Up till the 70s when they standardised on the F100s, there were some great vehicles floating around, like that Fairlane. I can remember Bowral having a couple of Austin Sheerlines, Western Suburbs had a Daimler, and there was also a Euro built Mercedes 220 trialled somewhere. 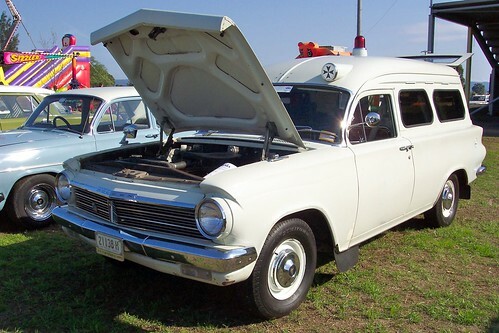 I managed to get a pic of a old Holden ambulance at this year Motorfest. At the moment ther are no fixed plans for the vehicles future. 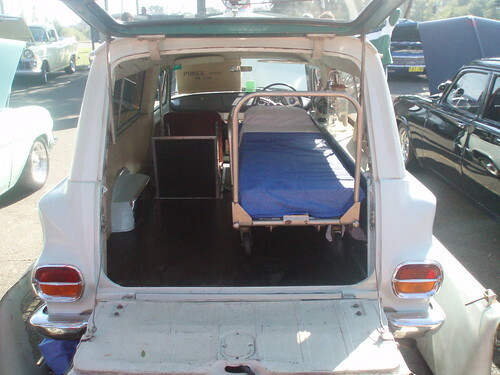 I think because of the lack of preserved ambulances and their part in Australian Automomotive History as a whole, it's probably worth considering an ambulance restoration. Having said this I recently spoke with a conservator at the National Museum of Australia specialising in cars and the like, and he stated that for many vehicles the heritage value is signifigantly altered and sometimes even lost when 'restored'. As an example a Daimler car C1950 ex Governor General currently being restored by the museum is causing them a degree of angst just trying to decide to what extent they should restore the vehicle, either back to its original, left in its as found state in a farmers shed or somewhere in between. The Mercedes Boronia mentioned in his reply was I believe at a Mercedes parts dealer here in Canberra a few years ago, according to a friend of mine it was full of rust and a little over priced. The ASNSW preserved vehicles used to be at Point Clare Stn. but has since been broken up to make room for operational cars. There's a Dodge in Goulburn and I think a Valiant at Lithgow. Maybe the Victorian Ambulance Historical Society may be able to assist, they have collection of 9 or 10 ambulances in the clubrooms at Thomastown (Melb), sorry I have misplaced their details. I can recall seeing a few "odd bod" vehicles in the car park of Rozelle Hospital a few years back, some seeming to have been out of use for a number of years - I'd love to know where all those GMC's like in your avatar Robert T went, they seemed to disappear completely? I have seen a couple of the GMCs running about in private service over the last 3 or so years. Robert T wrote: I think because of the lack of preserved ambulances and their part in Australian Automomotive History as a whole, it's probably worth considering an ambulance restoration. Having said this I recently spoke with a conservator at the National Museum of Australia specialising in cars and the like, and he stated that for many vehicles the heritage value is signifigantly altered and sometimes even lost when 'restored'. I agree and observe the same thing with old buildings all the time through my work. At what point is the material fabric and craftsmanship significance lost during a restore where more modern materials and potentially different craftsmanship techniques are used? I guess it is different for each item, but there is a point where an item's historical (hysterical depending who you talk to) value is diminished during a restoration. Sometimes it is better to keep hsitorical pieces as they end up for that reason, unless they have been significantly altered during their lifetime with unsympathetic modifications, which should be removed if possible. Having said that, if a restore or alternate use gets the building or car back in use with regular preventative maintenance, then sometimes that isn't a bad thing either and would ultimately allow for more people to enjoy and appreciate its significance, however diminished it may be. Robert T wrote: At the moment ther are no fixed plans for the vehicles future. 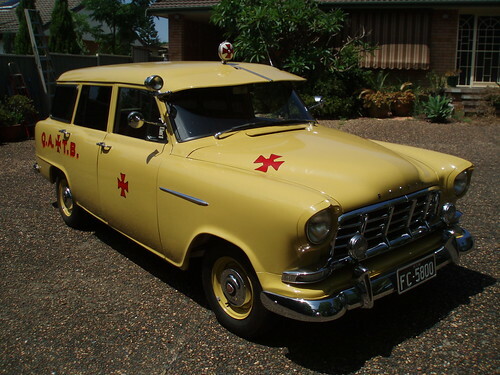 I think because of the lack of preserved ambulances and their part in Australian Automomotive History as a whole, it's probably worth considering an ambulance restoration. Having said this I recently spoke with a conservator at the National Museum of Australia specialising in cars and the like, and he stated that for many vehicles the heritage value is signifigantly altered and sometimes even lost when 'restored'. As an example a Daimler car C1950 ex Governor General currently being restored by the museum is causing them a degree of angst just trying to decide to what extent they should restore the vehicle, either back to its original, left in its as found state in a farmers shed or somewhere in between. When On Air was associated with the Chrysler and Valiant owners club the members were entertained one meeting by some slides of AP5/AP6 panel vans that served as Ambulances both in NSW and VIC/SA. From memory the NSW example shown was on trial whilst Vic and SA used Valiants fairly extensively not only as ambulances but also as Divi vans with the police. These vehicles are extremely rare now as they were built to order and not part of a standard body run. I wonder how many if any have survived?? On 16 March 1870, bushranger Harry Power and Ned Kelly stuck up and robbed Mr M'Bean! Out of time, Bean? I came across this picture when searching the web for my favourite ambulance model,the Ford F150 from the late 1980s. By the way,that Fairlane thing is so ugly it makes sin look good!Still,good luck with it's preservation as it is certainly unusual. Located the details for the Ambulance Historical Society, 3 Merchant Avenue, Thomastown Vic 3074 Tel. 0428 813 385. There is someone in attendance each MONDAY, hopefully will be extended in the near future. They are trying to display them as often as possible at local car shows, today they are at Emerald. One of the problems with preserving old ambulances is that a lot of them have second lives in some other capacity before being acquired, and thus a lot of the original fittings get removed or modified. It is then very difficult to determine exactly what the original configuration might have been, and even harder to get these parts back. PS I don't mind the Fairlane, it has a real 1950s USA ambo/hearse look about it. Thanks for the lead alburybuses2, I've made some contacts thanks to your information and hope to follow them up soon. The F250 in the above photo was aquired by myself and two friends direct from ASNSW after almost 4 years of negotiating. It was a difficult task but as noted by Boronia on resale many of the unique features of ambulances are often lost, we were fortunate enough to retain its features as well as much of its equipement, some that came with the vehicle and some that was donated like the Heartstart Defibrillator or "Packer Whacker" donated by Laerdal the manufacturer, in fact the only thing missing is two D size O2 Cylinders. Congratulations on the purchase, two very nice vehicles! Body: Steel & wood trimmings. Two front doors, one side door and duel rear doors. Any historical info on the vehicle like where it might have been commissioned etc or even of its value in its current form or as a restored vehicle that would be greatly appreciated. I would love to restore the vehicle as I have other Chrysler Royals, but if it will too expensive then I may even customise it. I would prefer to see it restored though. There are maybe three fully restored Chrysler Royal Ambulances worldwide. It's good to see someone preserving a Chrysler Royal ambulance. I don't know of any other preserved examples particularly in the ACT or NSW. There was up until a couple of years ago a complete unit in a yard in Gooloogong NSW on the Grenfell to Orange Rd. When I last saw it I wasn't able to get up close but was told it was a Comeng Body GRP body. Sadly it is no longer there and I have failed to locate it since. The matter of value as with all specialty interests is determined by what someone is willing to pay. PM me if you like and I can try with the help of some like minded friends source the history of the vehicle. Thannks for your email. I cant actually PM you yet, not enough activity yet it says. Having said that, that would actually make it cheaper and easier to work with but the question would be should it stay as wood or get re fabricated in steel? The other consideration is that if no one in Australia is interested in these vehicles, then why go through the pain in restoring at all and why not just get it back on the road running as a panel van and simply enjoy it. Ambulance Service of NSW are in the process of transferring their Historic vehicles to the Temora Rural Museum. 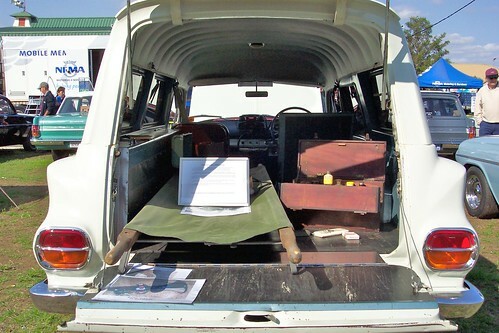 The museum previously had on display 1953 International AL110 and 1956 FJ Holden panelvan ambulances that served in the District, and the Temora Historical Society had also acquired a 1951 International for restoration that made up the fleet at Temora in the 50's. After recent negotiations the historic vehicle held by ASNSW are slowly being relocated to the Museum for display. Previously the historic vehicels were spread out in ambulance stations across the state wherever there was room. The vehicles now located at Temora are a 1938 Dodge (Kyogle District), a ZC Fairlane (Parkes), a 1971 Valiant (Tenterfield District), and a 1973 XA Falcon (Parkes). Other vehicles that should soon be relocated are a Horse drawn waggon, 1961 Willys-Jeep rescue truck (St-George Sutherland District) - the first rescue truck in service in NSW, 1964 International AB110 (Queanbeyan District), and a couple of F100's. 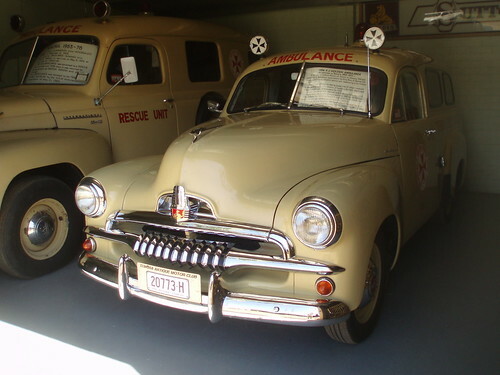 1956 Holden FJ ambulance. Operated by the Temora District of the New South Wales Ambulance Transport Service Board. Modified from a panel van by W. S. Grice Motor Body Works in the Sydney suburb of Summer Hill. 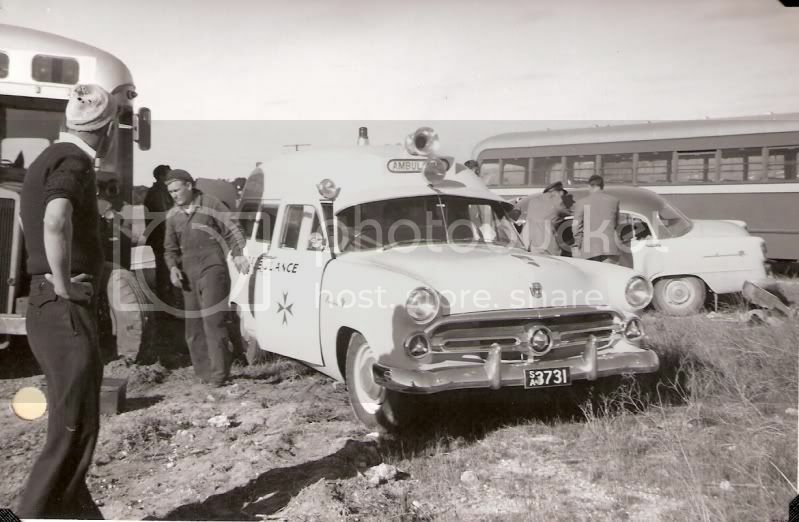 When commissioned it was one of three ambulances in operation in Temora, the other two being International Harvester trucks, also converted by Grice's. One of the Internationals, a 1953 AR 110 was later converted for use as a Rescue Unit, and can be seen in this photo. It is in original (unrestored) condition. Both of these cars are on display at the Temora Rural muesum. The other International, a 1951 model, is reported to be under restoration by the local vintage car club. 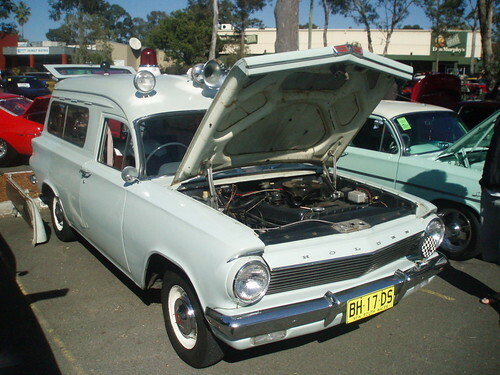 1963 Holden EJ ambulance. Operated by Scottsdale Hospital in Tasmania. The ambulance was converted from a panel van. 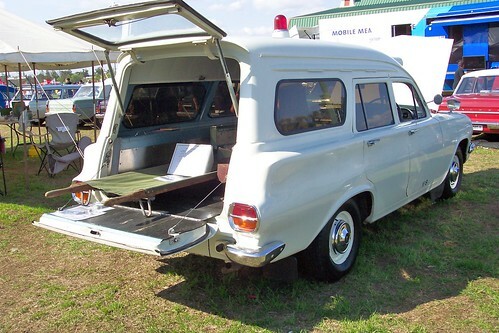 1965 Holden EH ambulance. Operated by St John Ambulance Brigade in Tasmania, and stationed at the Hobart suburb of Moonah. Converted from a panel van. Last edited by sv1ambo on Sat Feb 23, 2013 12:36 pm, edited 1 time in total.